Today’s piece is a pair of earrings. These earrings are made with rhodium plated nickel. Rhodium is a type of silver, and is an ingredient to the making of platinum! Inside these rectangles are blue lapis lazuli, blue lace agate, and a white faux pearl. Each stone was carefully and individually placed in the ‘frame’ to give a mosaic texture to the earrings. If you would like this piece, a similar piece, or any unique piece of jewelry; contact us! Please take a visit to our website, to see what pieces will be available for the show! Also, stop by the Agape Gifts Facebook Page as we finish unveiling some of the new pieces and help guess what each of the pictures are! Today’s feature is another fusion piece. Many of you who have seen our board, will most likely remember this piece, but it is worth mentioning again. This piece is a bracelet, a choker, and a necklace. The choker portion is made with rubber tubing, the round-ish beads are green kambaba jasper, and the center square is a green aventurine. The bracelet is made of hand twisted sterling silver wire. 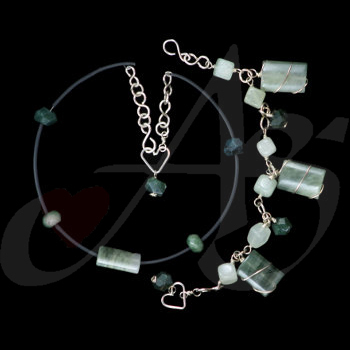 The light green diamonds are cube green moss agate, the tubes are rectangular cut green aventurine, and between the aventurine are two more kambaba jaspers. This piece is very versatile, and currently available! If you would like this piece, a similar piece, or any unique piece of jewelry; contact us! 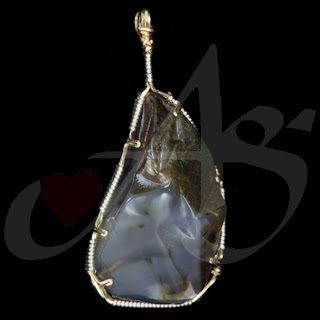 Don’t forget to check out our website for more amazing pieces of jewelry. 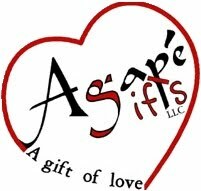 Also stop by the Agape Gift’s Facebook page as we pre-unveil our line for next year! Today’s piece is a Fusion Necklace. This necklace is made up of two bracelets. 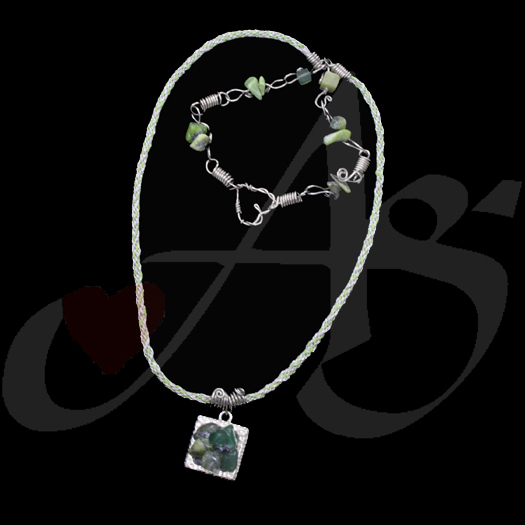 One bracelet is made with nickel wire and green stones. The other bracelet is made up of hand woven cord. This piece is currently available! If you would like this piece, a similar piece, or any unique piece of jewelry; contact us! If you liked what you saw here, check out our website! Visit our Facebook page as we pre-premier our newest line. Here is today’s featured piece of the day, it is a brass ring. 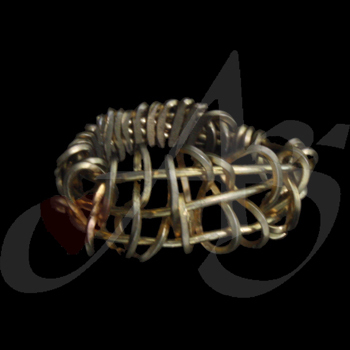 The ring is made by weaving 16-gage square brass wire. This piece is currently available. If you would like this piece, a similar piece, or any unique piece of jewelry; contact us! Don’t forget to check out our website and Facebook page! We are pre-premier'ing' our jewelry on the Facebook page, so check it out before our show on November 4! Today’s piece is an ankle bracelet. This ankle bracelet is made with silver, magnetite, and pearls. This piece is currently available! If you would like this piece, a similar piece, or any unique piece of jewelry; contact us! Don’t forget to check out Agape Gifts’ website and Facebook page! Today’s piece is a pair of earrings. 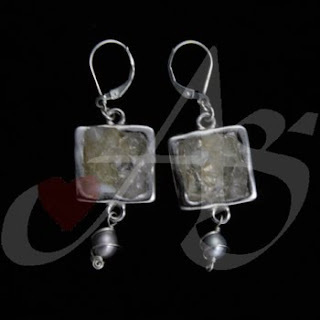 These earrings are made with sterling silver and rhodium. Inside the rhodium square are nugget opaque bead chips. Handing from the square is a wire-wrapped pearl. This piece is currently available at Faith@Work in Troy! If you would like this piece, a similar piece, or any unique piece of jewelry; contact us! Don’t forget to check out our website! Take a peek at Agape Gifts’ Facebook Page as we give you a sneak peek at the new pieces before the November 4 show! Today’s piece is a pair of hoop earrings. These earrings are made with 14/20-karat gold wire. 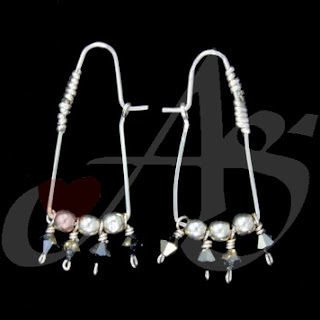 On the bottom of the earrings are gold-colored Swarovski crystals separated by gold Bali beads. This piece is currently available! If you would like this piece, a similar piece, or any unique piece of jewelry; contact us! If you like this piece, there are hundreds more on our website! Don’t forget to check out the Agape Gifts Facebook Page as we are giving a sneak preview to the new fall line – which will be fully unveiled on Friday, November 4. Today’s piece is a Rosary bracelet. 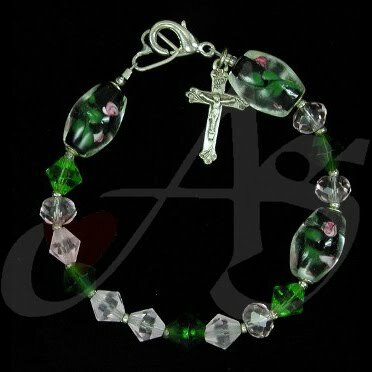 This Rosary bracelet is made with crystals and lampwork glass. The ‘Our Father’ beads are made with hand painted flower lamp-glass beads. The ‘Hail Mary’ beads are a mixture of Chinese crystals. This piece is currently available! If you would like this piece, a similar piece, or any unique piece of jewelry; contact us! Don’t forget to check out our website for more great pieces of jewelry! Today’s piece is a beverage charm. 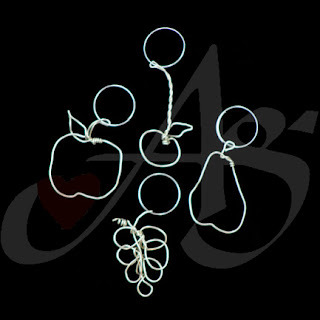 This beverage charm is made of nickel wire, and is in the shape of fruit. The fruits are: apple, cherry, pear and grape. This pieces are currently available! If you would like this piece, a similar piece, or any unique piece of jewelry; contact us! 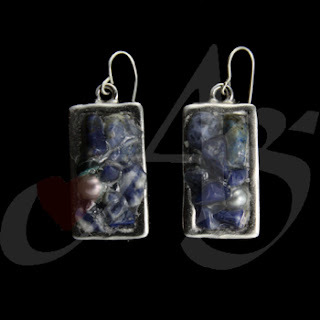 Don’t forget to check out our website for more great pieces of jewelry. Also, check out Agape Gifts’s Facebook page where we are unveiling a new piece of our November line each Monday, Wednesday, and Friday! Today’s piece is a handmade, wire twisted bracelet. This bracelet is made with .925 Sterling Silver wire links. It is rather dainty, but wears well! This piece is currently available! If you would like this piece, a similar piece, or any unique piece of jewelry; contact us! If you like what you see, please check out our website. Don’t forget to check out the Agape Gift’s Facebook page to watch the new pieces being pre-unveiled! Today’s piece is a necklace. This necklace is made with onyx, magnetite, and buffalo bone. Hanging from the center of this necklace is a two-sided cross… so the necklace is never backwards! This piece is currently available! If you would like this piece, a similar piece, or any unique piece of jewelry; contact us! Don’t forget to check out our website, for other great pieces of jewelry! “LIKE” Agape Gifts on Facebook and guess our piece of the day to unveil our new line before the Agape Gifts Annual Show on November 4. Today’s piece is a pendant. 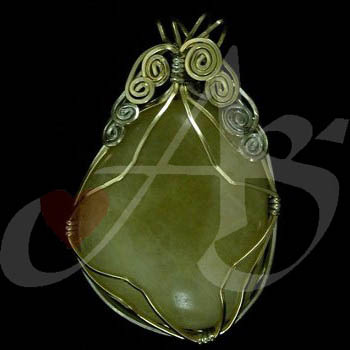 This pendant is a river rock, wrapped with 14/20-karat gold filled wire and sterling silver .925 wire. This pendant is currently available!! If you would like this piece, a similar piece, or any unique piece of jewelry; contact us! If you like what you see here, please check out our website! Don’t forget to check out the Agape Gift’s Facebook for another piece from the new line to unveil! Today’s piece is a hand made necklace. This necklace is made with silk cord, copper and pearls. The silk is woven through the copper links. 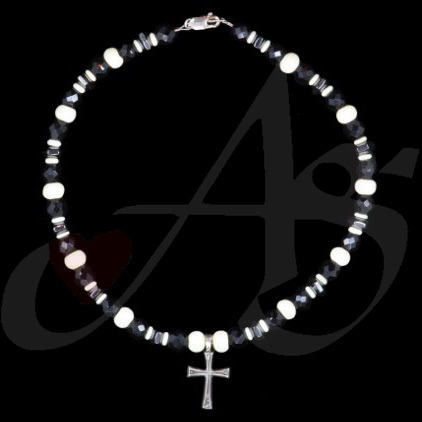 There are small hematite beads hanging from the pearls. This necklace is also adjustable due to silk knots. This piece is currently available! If you would like this piece, a similar piece, or any unique piece of jewelry; contact us! If you like what you see, please check our website! Today’s piece is a choker necklace. This necklace is nickel wire wrapped in rubber tubing. 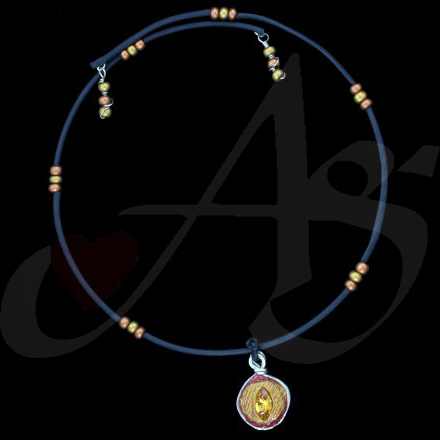 The bronzed beads are glass seed beads, and the center medallion is a hand-made polymer pendant. This piece is currently available! If you would like this piece, a similar piece, or any unique piece of jewelry; contact us! Don’t forget to check out our website for other great pieces of jewelry! Also, please check out the Agape Gift’s Facebook page for our ongoing game to help introduce many of the new styles of fall 2011. Today’s piece is a bracelet. This bracelet is made with sterling silver, gold, white and black cultured pearls. 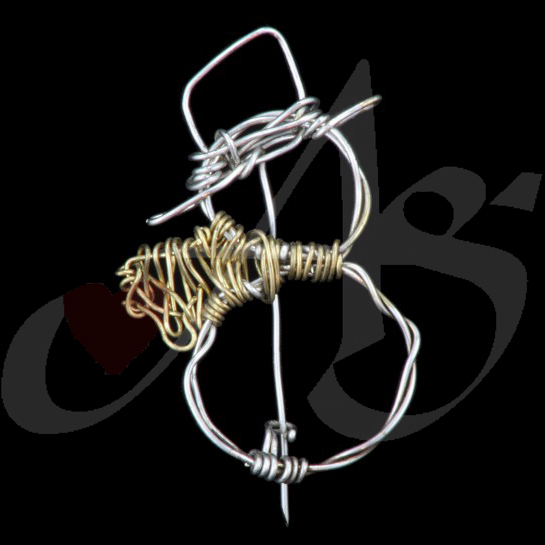 The sterling silver circle-in-squares are held together with 14/20-karat gold filled wire. The bracelet is linked together with 14/20-karat gold filled wire. This piece is wonderful for any dressy occasion you might have! If you would like a similar piece, or any unique piece of jewelry; contact us! If you like what you see here, see what is available on our website! Today’s piece is a fusion necklace. This Necklace is made up of three bracelets. The silver hand woven cord, grey hand woven cord, and silver links are all individual bracelets. All three together may be worm as a long necklace; two of the three can be worn as a smaller necklace with the leftover bracelet on your wrist. The center is a nickel square with colored stone chips lacquered in the middle. This piece is currently available! If you would like this piece, a similar piece, or any unique piece of jewelry; contact us! We have more than just this piece – check out our website! “LIKE” Agape Gifts on Facebook and participate in our ‘Guess-The-Piece’ game to help unveil the new line! Today’s piece is a necklace. 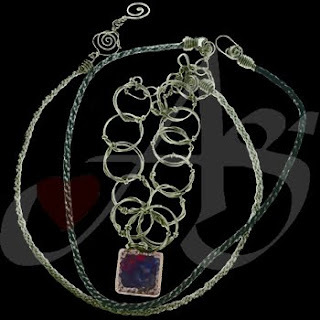 This necklace is made with turquoise, amethyst and sterling silver. The turquoise are in nugget and chip sizes. The amethyst is in small chips, which adds a neat texture to the necklace. This piece is currently available! If you would like this piece, a similar piece, or any unique piece of jewelry; contact us! If you like what you see here, check out our website! "LIKE" Agape Gifts on Facebook and participate in a fun way to reveal the new product line of fall 2011! Today’s piece is another pendant. This main stone is a brown agate. 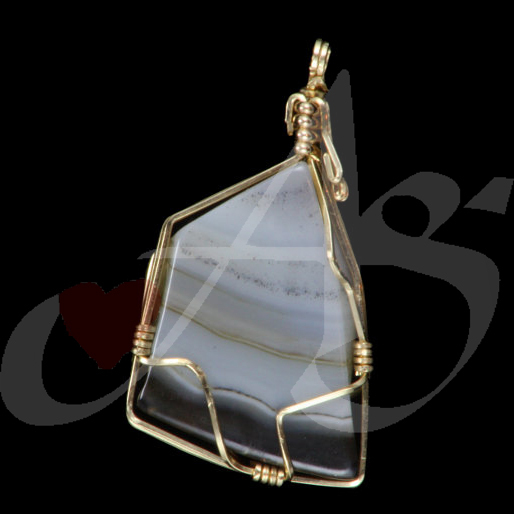 This agate is wrapped with 14/20 karat gold-filled wire. This pendant is currently available! If you would like this piece, a similar piece, or any unique piece of jewelry; contact us! If you are intrigued by what you see here, please check out our website! Be sure to LIKE US on Facebook as well! Today’s piece is a pendant. The stone in the pendant is a large teardrop nugget brown agate. The agate is hand wrapped in Gold 14/20 karat wire and reinforced with sterling silver wire. This piece is currently available! Don’t’ forget to check out Agape Gifts’s Facebook Page for another new piece. Don’t forget to mark your calendars for November 4 – and see these new pieces in person at the premier! Today’s piece is a zipper pull. I apologize for putting a snowman up yesterday… I don’t know what I was thinking – that is a January piece! Today’s zipper pull is made with nickel and copper sheet metal. The nickel metal is hand stamped for texture. The copper metal was hand shaped. The two parts together mold to your fingers rather well, which makes opening any zipper simple! This piece is currently available! If you would like this piece, a similar piece, or any unique piece of jewelry; contact us! If you like what you see today, please check out our website! Today’s piece is a pin. In lieu of these chillier days, we have pulled out our winter jackets – and this adorable little snowman accompanies them. This snowman is made of nickel and brass – so it won’t tarnish over the summer. This piece is currently available! If you would like this piece, a similar piece, or any unique piece of jewelry; contact us! Feel free to peruse our website, if you liked what you saw today! LIKE Agape Gifts on Facebook and participate in a contest!